Level of Effort is typically chosen where it is difficult to define the work content or scope, Management activities are a typical example here. It is important to note that there can still be a Cost Variance (CV) on LoE type activities. 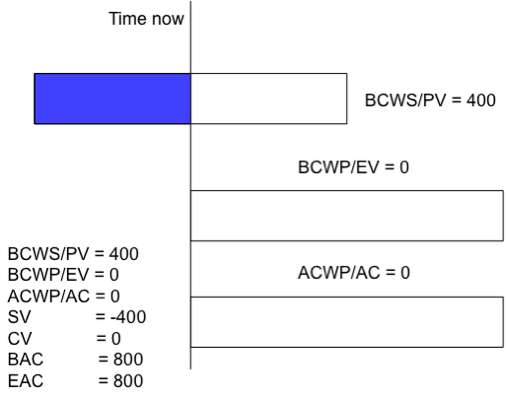 LoE as defined in Earned Value terms is where the earned work is the same as the planned work (BCWP = BCWS or EV = PV), in other words the Schedule Variance (SV) will always be equal to zero and the Schedule Performance Index (SPI) will always be equal to one. There are occasions however where this rule may be broken, and when using Level of Effort it is important to understand some potential effects that may impact on the Earned Value calculations. LoE Operating as it should. 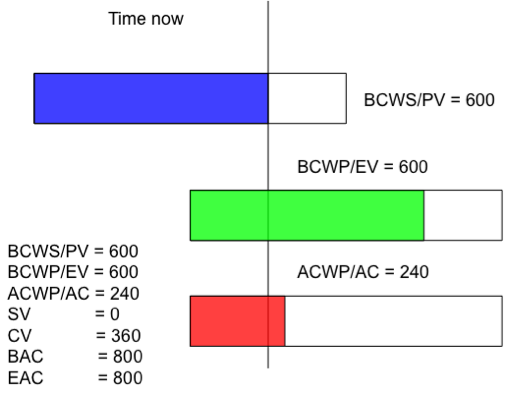 In the below example we have our baseline to date (BCWS or PV) which is shown as the BLUE block. 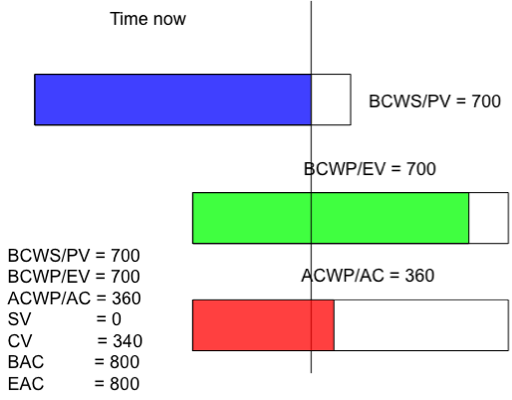 The work achieved to date (BCWP or EV) is represented by the GREEN block and the actual spend to date is shown as the RED block. 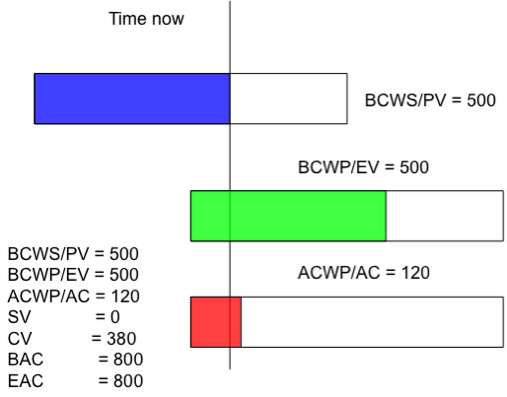 This picture shows the data as we would expect a LoE activity to be operating, the achievement (BCWP or EV) equals the baseline to date (BCWS or PV). As expected the SV will be zero. There may be occasions where the start date of an LoE activity is re-forecasted to start later than initially planned. As you can see from the below diagram, the baseline profile has remained the same yet the activity has now been re-forecasted to start at a later date. 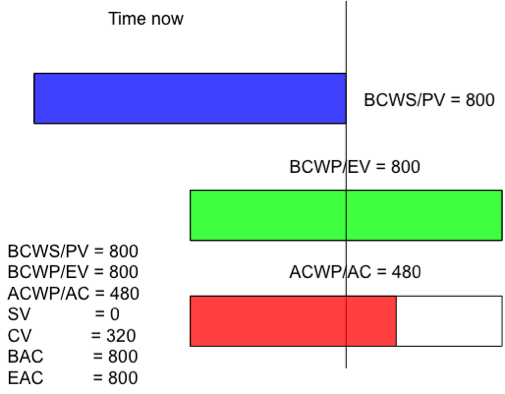 The work achieved (BCWP or EV) to date does not equal the baseline to date (BCWS or PV) so the SV is not zero. This effect continues through each period and each period that passes the Schedule Variance (SV) only increases. In this period we are about to actually start the re-forecasted LoE activity, just look at the effect in the next period. As this is a LoE activity and as we have already described earlier this means that the SV will always equal zero and the SPI will always equal one. Now the activity has started all the total amount of the budget planned to date (BCWS or PV) will be claimed. 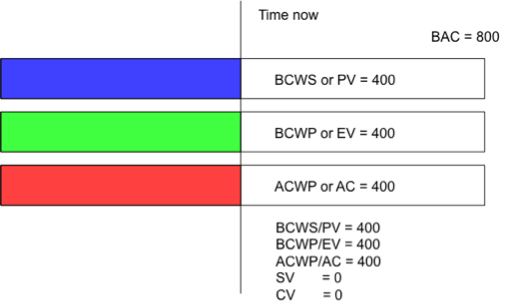 Only this period actuals (ACWP or AC) will be claimed as the work has started in this period. Straight away this is giving a false indication of reality, as we move through the periods the position only worsens. 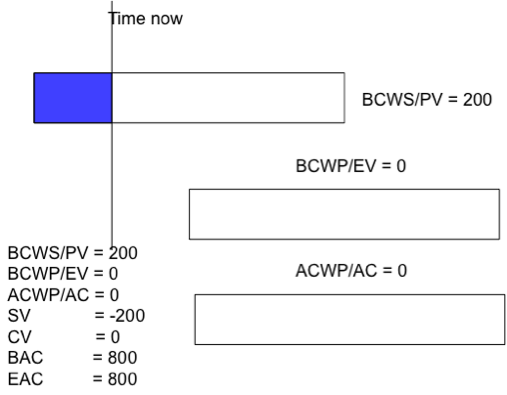 In this period it could be assumed that the work has been completed as the work achieved to date (BCWP or EV) equals the Budget At Complete (BAC), however in reality there is still several more weeks to achieve. Looking at period 8 the data is indicating that the work has been completed and there has been an underspend for the achievement of that work. This is painting a favourable picture when in actual fact spend will still to be accrued until the activity has completed in reality. As the SPI and CPI are unreliable in this instance there would be an impact to other calculations such as IEAC1 and IEAC2. 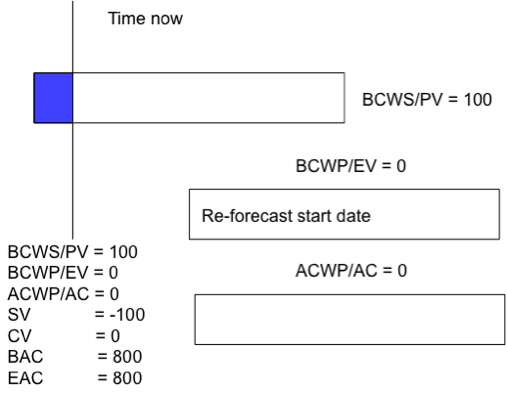 As the BCWP is not a true representation of reality the TCPI(E) and TCPI(B) would also be unreliable hindering the predictive capability of Earned Value. For further articles on Earned Value Management and other Project Control articles please visit our blog on our website www.myxacom.com where knowledge is no weight to carry. The power of Earned Value data lies in the forecast data that can be used to challenge and indicate the likely out turn cost of a project on completion. TCPI(E) stands for Target Cost Performance Index (Estimate), the value derived from the TCPI(E) formula indicates the level of efficiency from the reporting period to the completion of the project that the project requires to achieve to meet the forecasted Estimate At Completion. It is important to use the TCPI(E) value in conjunction with the trend of the CPI value to assess if the TCPI(E) value is achievable given past performance. If it is considered not to be then the Estimate At Complete (EAC) may require revision. For example if the CPI has historically trended around 0.65 and the TCPI(E) is indicating that to achieve the EAC there needs to be an increase to 1.28 from this point forward then what is the likelihood of achieving this? If this is not likely then the EAC would need to be revisited. Two of such indicators are Independent Estimate At Complete 1 and Independent Estimate At Complete 2, more commonly known as IEAC1 and IEAC2. The IEAC1 formula calculates the IEAC by subtracting the performance to date from the total budgeted value at completion and dividing by the Cost Performance index (CPI). This provides a more optimistic view of the likely out-turn cost than IEAC2. IEAC1 = Actual Cost of Work Performed + (Budget At Complete – Performance to Data)/Cost Performance Index. The IEAC2 formula calculates the IEAC by subtracting the performance to date from the total budgeted value at completion and dividing by the Cost Performance index (CPI) multiplied by the Schedule Performance Index (SPI). This provides a more pessimistic view of the likely out-turn cost than IEAC2. IEAC2 = Actual Cost of Work Performed + (Budget At Complete – Performance to Data)/(Cost Performance Index X Schedule Performance Index). The IEAC values are typically used to indicate the likely out-turn cost of a project at completion based on performance to date. 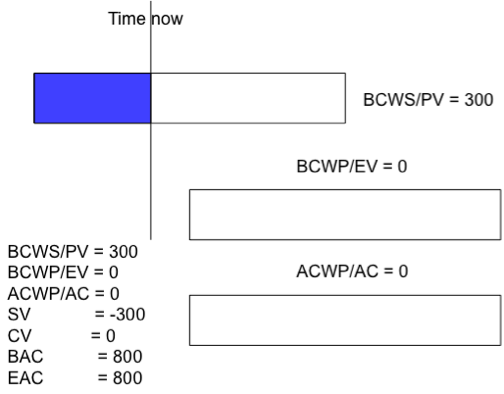 This can be used to assess and challenge Estimate At Complete values provided by the project teams to help ensure that a realistic out-turn cost is forecasted. It is important to used IEAC in conjunction with EAC as the IEAC is mathematical outcome and does not take into consideration the potential savings or additional overspends that project team members are aware of. Earned Value Provides multiple metrics based on past performance to calculate future out-turn positions. This article describes Schedule Performance Index and Cost Performance Index. A value of 1.00 indicates that the work is on track against the baseline or planned work. Below 1.00 would indicate that things are behind schedule and above 1.00 indicates an ahead of schedule position. It is important to note that the SPI will always return to 1.00 on completion whether late, early or on time. Earned Schedule addresses this effect, for more information visit ‘Can You Tell the Time?’ on the Earned Schedule website. CPI – Cost Performance Index is calculated from the work performed and the actual cost of that work. A value of 1.00 indicates that the spend is in line with the work performed, below 1.00 indicates an overspend and above 1.00 indicates an underspend. In other words for every 1.00 hour or unit of currency spent what is the return? For example a CPI of 0.50 would indicate only 50% of the initial 1.00 invested has been returned, showing an inefficiency of 50%. In our seventh article looking at the 14 point check we described how we at checked Negative Float, in this post we are going to take a look at High Duration. The DCMA criteria states that the total number of activities that have a duration longer than 2 months (44 working days) should not exceed 5% of the total number of activities in the schedule. Step 1. In project view add the Total Activities column and make a note of this number. Step 2. Create a new report using the Report Wizard, select Activities as it is activity data we require in the report. Add the Remaining Duration column as we are looking to find out how many activities have a duration of over 44 days. Step 3. Create a filter to show only the activities with a Remaining Duration of over 44 days. Click through and type in the report name. Step 4. Run the report ensuring to select ASCII and ensure that the Text Qualifier is set to “ so the output will be in Excel. Step 5. Highlight the High Duration numbers and make a note of the count, divide this by the Total Activities number noted dow earlier. If the percentage is 5% or less than the criteria has been met, if above the 5% then a schedule review may be required. There are a further 13 checks prescribed by the DCMA which along with the Logic Check will be detailed out in further supporting documentation and video tutorials at http://www.myxacom.com where knowledge is no weight to carry. In our sixth article looking at the 14 point check we described how we checked High Float, in this post we are going to take a look at Negative Float. The DCMA criteria states that no activities that are incomplete should have a float total of less than 0 working days. Step 1. In the Project view add the Total Activities column and make a note of the Total Activities in the schedule. Step 2. Create a new report using the Report Wizard, selecting Activities as it is activity data we require in the report. Add the Free Float column as we are looking to find out how many activities have a Negative Float value. Step 3. Create a filter to show only the activities with a Float value of less than 0. Step 4. Click through to type a report name, populate with the name then run the report. As we want the report in Excel select ASCII and ensure that the Text Qualifier is set to “. The report will open in Microsoft Excel, highlight the High Float numbers and make a note of the count. Step 5. Divide the number of negative float activities by the total number of activities. Any incomplete activities with float of less than 0 working days means the criteria has not been met and the schedule should be reviewed. The DCMA states a 0% threshold on negative float.